According to the opinion of historians and geographers such as Ptolemy, Diodorus and Strabo, Castellammare del Golfo was born as Emporium Segestanorum, port of Segesta, a nearby city which shared the same vicissitudes until its fall. The Arabs occupied Castellammare del Golfo from 827 AD, and called it "Al Madarig", which means "The Steps", probably due to an uphill steep street leading from the harbour to the area of the fortified bastion. It was the Arabs who first built the castle fortress, later enlarged by the Normans. The arab building rose on a rocky outcrop near the sea, linked to the mainland by a wooden drawbridge. In 1072, Roger and Robert de Hauteville took Palermo and twelve important arab castles of Sicily, including "Al Madarig". Under the Swabians the city became more important, and it was first called "Castle on the sea". During the struggles between Angevins and Aragons, Castellammare first came out against the Angevins, and then supported them against the Aragons. The war ended with the victory of Philip II of Aragon, who punished Castellammare for treason, closing the port and forbidding any maritime activities. Once overcome the restriction to harbour activities, Castellamare began to flourish again, and became one of the main exporting wheat ports of Sicily. In 1521 it was built the first external fortification wall arounf the castle and, simultaneously, the Main Church. Thereafter, the city grew rapidly, while politically it passed from one noble family to another (from Peraltas to Philip of Antioch, from John Perallo to Alliatas, then De Lunas and Aragons, up to the Moncadas, the Ventimiglias, Pignatellis, and even to the Nosellis and Perallos again). The 17th century saw the end of Spanish hegemony in Sicily, followed by the Savoy domain with Vittorio Amedeo II. An historical reenactment recalls the battles between spanish and Savoys: a legend tells that on the 13th of July 1718, during a conflict between Philip V of Spain and Vittorio Amedeo II of Savoy, five spanish ships were fleeing from the English fleet, looking for refuge in the port of Castellammare. The town, in order to defend the spanish, fired cannons against the british ships, which reacted badly with the bombardment of the coastline. Threatened and terrified by the reaction, the inhabitants of Castellammare del Golfo invoked the help of the Patroness Madonna. She appeared with a host of five angels, dressed in bright white, deadly frightening british away. The next period was characterized by the arrival of the Austrians first and Charles of Bourbon then, King of the Two Sicilies. During the uprisings of 1820, Castellamare aspired to independence; in 1848, it was set up a committee of citizens in order to support liberal ideals against Bourbon rule. When Garibaldi arrived in Sicily in 1860, many citizens from Castellammare, escaping the control of the Bourbons, managed to bring military aid to the partisans engaged in the battle of Calatafimi. The intervention of the inhabitants of Castellammare was so relevant that, after the victory, the "Hero of Two Worlds" came to Castellammare to thank the citizens for their help. However the population, disillusioned by the promises made by Garibaldi, in January 1862, rose up against the wealthy class of the country. 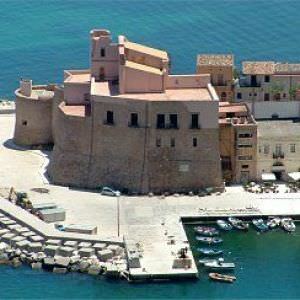 Since then the life of Castellammare del Golfo followed the vicissitudes of italian politics.